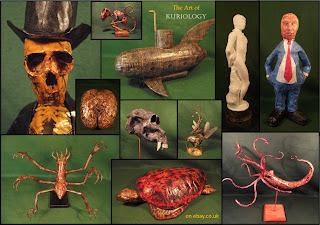 Kuriology : Cabinet of Curiosities Art and Oddities : To snipe or not to snipe, that is the online auction. To snipe or not to snipe, that is the online auction. that is the online auction. To Snipe or not to Snipe, that is the online auction. whether tis noble to bid manually than use tech software. Like many people back in the early 2000's, I fell in love with the ebay auctions. The fun of bidding on an item which you may otherwise not find on the high street. The possibilities (frequent back then) of picking up it up as a real bargain. That was as a buyer. As a seller, always the chance that your item would fetch far more than the value you yourself placed upon it. However, I could not understand how sometimes I was pipped at the post in the bidding at the very last seconds. It was a few years before I was tipped off to 'sniping'. Auction sniping is the practice, in a timed online auction, of placing a bid likely to exceed the current highest bid (which may be hidden) as late as possible—usually seconds before the end of the auction—giving other bidders no time to outbid the sniper. This can be done manually, by software on the bidder's computer, or by an online sniping service. Use of an online service is said to decrease the failure rate of the snipe, because the website has more reliable servers and a faster Internet connection with a less variable delay in sending data (jitter), allowing the bid to be placed closer to the deadline, even arriving within the last second. Yes, I admit to having my own free snipe account. This 'free' account enables me to bid on up to x5 different items a week using snipe technology free. I tend to only use snipe on items which tend to have a higher value or I 'really' want to stand a good/better chance of winning, but do not want to run bidding up early on in an online auction. Also, using snipe tends to reduce risk of falling victim to 'shilling' bids. These are bids placed by the owner of the object for sale or placed by an associate of theirs to artificially inflate the bid value of an object. Shilling bids Sniping closes a loophole to fraudulent practice by a shill (an agent for the seller, which may be another account of the seller) to raise the bid to the maximum. They then hope the original bidder will increase their maximum bid even by a small amount to win the auction. The danger to the seller in this case is that the original bidder may not choose to increase their bid, leaving the seller with a futile transaction (selling the item to themselves) which will often still incur a fee from the auction service. Bidding at the last moment prevents a shill bidder from pushing the auction higher, as they have no time to make the incremental bids required. Many a person I have spoken with have not clearly understood 'how' auctions work & know nothing of shilling bids or sniping. Often bemoaning how they had been winning an absolute bargain item all week at auction to suddenly loose it in the last few seconds to a higher bid. The bottom line is he/she who is willing to bid most at auction - wins. ...but in my experience sniping can sometimes help you win! PS. There is also BIN sniping (BIN = Buy it Now), but that's another kettle of fish altogether & not related truly to last-sec online auction sniping.